With grateful thanks to Raksha. The two grey-cloaked men entered the chamber; its stone walls were cold and unwelcoming. The room had been Théodred's private room, but bore scant trace of its former occupant. It was bleak and sparsely furnished, holding only a rough pallet and a table and a chair. A meagre fire burned in the hearth, the flames offering little light and less warmth. Moving purposefully, Aragorn approached the table and carefully set the covered object he carried down upon it. "Is this wise?" Halbarad asked anxiously. He lit the lamps, a frown creasing his pale face. "Probably not, but it must be done. Remember, as the Heir of Elendil, I have the right to use the Orthanc-stone. The message you have brought me tonight from my Lady rekindles the fire in my blood. This is one of the trials I must overcome if I am to become what I was born to be!" "I do not doubt your claim on the Stone, but to press it this night? You are weary after your labours of the past days. At least take rest first!" Halbarad pleaded. "Would that I could, but time is a luxury we do not have. You need not stay, Halbarad; go and rejoin the others." "I will not leave you," Halbarad said staunchly. "Thank you, kinsman." Aragorn clasped the other's shoulder. "Your presence will give me comfort, but I must ask you to remain silent, and above all, do not approach me, lest our Enemy espy you from the stone." Halbarad nodded reluctantly. He sat down upon the pallet in the far corner, his eyes never leaving Aragorn, and his limbs tense, ready to rise swiftly if needed. Aragorn seated himself in front of the stone and flung aside the cloth that covered it. At first, the palantír seemed filled with heavy mist. Then a pinprick of light widened, became a sullen glow, which gradually burned away the mists, to reveal a great lidless eye. The great eye fastened upon him. Aragorn was suddenly hit by a wave of ancient malice that rocked him from head to toe. But if Sauron thought to cow him with such evil, as if the Lord of the Dúnedain were a young hobbit or simple Bree-man, then their adversary would soon learn otherwise. Aragorn smiled grimly. Let it begin! Aragorn stared at the Great Eye locked in combat as fierce as any passage at arms. The hours passed as Halbarad watched his lord sit still as if turned to stone, hardly seeming even to breathe. The first glimmer of dawn lightened the eastern sky when Aragorn drew Andúril and rose to his feet. The Great Eye vanished from the globe, its attendant fires slowly dissipating. The air in the room suddenly felt cleansed. Aragorn threw the cloth over the palantír. He swayed on his feet. Halbarad caught him before he could swoon and half dragged, half carried his kinsman to the pallet. Once there, he drew off his cloak and wrapped it around Aragorn. He uncorked his water bottle and coaxed Aragorn to swallow a draught. The Heir of Isildur was trembling and ashen faced. Halbarad placed a comforting arm around his shoulders. As daylight entered the room Halbarad clearly saw his Chieftain's haggard features. 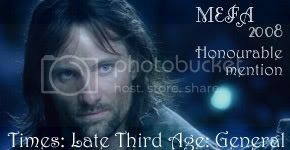 Aragorn seemed to have aged by decades overnight and looked every one of his eighty-eight years. "I fear tonight's struggle has cost you dearly," said Halbarad, unable to hide his concern. Aragorn managed a grim smile. "The attempt had to be made to draw Sauron's attention," he said. "I told the Dark Lord; 'I am here, Sauron, I Aragorn son of Arathorn the heir of Isildur; he whom you have long sought and believed was slain. Behold! I bear the tokens of my lineage, the star of Elendil and the sword that was broken! This sword now reforged shall once again mete out justice to you. I am coming to Minas Tirith to take what is my rightful inheritance!' The struggle was hard, but my will prevailed." "The Valar be praised, we have hope at last!" Halbarad exclaimed. "Sleep now Aragorn, rest a little while you may." Aragorn lay back on the pallet and closed his eyes. He found, though, that he was too weary for sleep. Halbarad was already snoring loudly. He regarded his kinsman with a wave of affection. They had shared many adventures together over the years, but drawing Sauron's Eye had been Aragorn's hardest trial yet. A sudden flash of foresight chilled his blood. Halbarad would not live to see the outcome of this struggle. Aragorn wished he could send his kinsman back to the relative safety of his home with his wife and children in the North. Yet he knew Halbarad would not leave his Chieftain's side as the hour of Aragorn's destiny approached. Aragorn had chosen this course. He must now follow his path to its bitter end.